A product containing biologically highly utilisable colloid solution of more than 64 elements in their natural form, with biological utility of as many as 98% (ion solutions 2-6%; chelates 60% max.). In colloid form, even toxic elements are absolutely harmless and can even play a positive role in the body. Do not burden the body with excessive minerals. Unused colloid minerals are equally easily excreted from the body. - A source of colloid minerals with almost 100% utility. Activates most enzymes of the body. - For gastrointestinal tract disorders preventing the absorption of minerals [Regavet]. - Universal for reptiles and birds [Gynevet]. - For molting disorders, for shedding of skin in reptiles [Gynevet]. - Adjunct antidote in intoxications [Cytovet]. - Diabetes, thyroid gland and other endocrine gland disorders [Regavet, Gynevet]. - Against itching – external use [Audivet]. - Surface skin wounds (incl. burns) – internal as well as external use [Gynevet]. 100% mineral water (colloid solution). For all animal species regardless of weight; mix 5–20 drops of the product with 1 litre of drinking water. For fish, amphibians and water reptiles: mix 5 drops with 1 litre of bathing water for the period of 1-2 hours. Shake well before use! It is recommended to use the product within three months of opening. 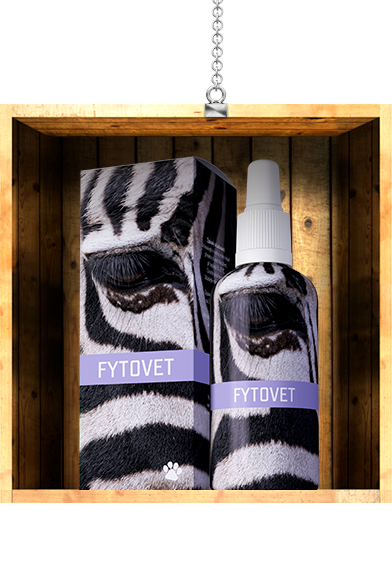 Fytovet is a unique mineral product which can compensate deficient elements in the body during a short period of time. Its effect is especially apparent after diarrhoeas or in chronic intestinal conditions in dogs and cats.